Over the years, one peculiarly desi genre has grown closer to the heart than would be considered healthy. Though it’s difficult to pinpoint the exact moment this particular love affair took off, I reckon the early B movies such as Ssssnakeand Harry Novak’s Rattlers may have been early warning signs. However the demand for fresh reptilian fodder always seemed to exceed the supply and it was a frustrating wait for the next slithery cinematic instalment especially as in the 70s and 80s CGI was a lifetime away and Harryhausen-like stop motion magic a relic of the past. Die hard snake-maniacs had to make do with the odd cameo in films such as The Phibes movies and the occasional Bond or Tarzan epic to get a fix of the good stuff. However life was to change forever when the crossover was made from Hollywood snake movies to the phenomenal snake movies from our own part of the woods. Desi snake movies are far more than monster movies as they are intricately intertwined with wonderfully romantic legends, myths and exotic folklore of days gone by. Also, in our movies, inevitably the snake is not cast as the villain but as a saviour just as mostly feared Gojira is a saviour to his Japanese followers. Snake movies have been around in South Asia ever since cinema took off but I am unsure of which would qualify as being the first ever snake themed movie. Over the years the snake movie has thrived enough to evolve into an entirely new genre of cinema in South Asia. It wouldn’t be too wild a contention to make that snake movies easily outnumber courtroom dramas or even heist movies in South Asia. 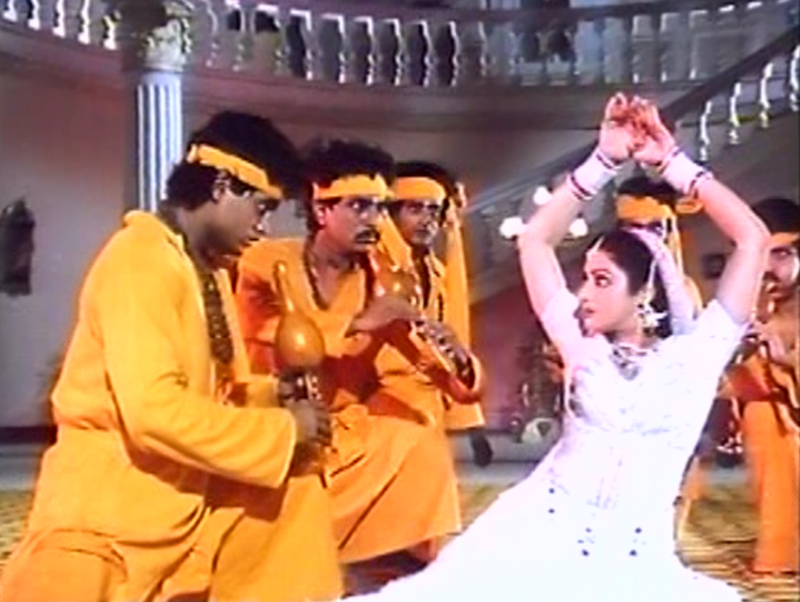 There have been countless snake movies over the years and even Pakistani cinema has tried its hand at the game with films such as Saperan, Naag Nagin, Naag Muni and the incredible Shabnam Javed Sheikh flick Sheshnagin which featured a rock band entirely composed of some highly musically skilled snakes. Quite a tune they let rip once in while too. Still Pakistani snake movie output is a mere ripple when compared to the reptilian wave of snake themed movies from India. Snake movies have always been avidly watched amongst our brood and I remember the drooling excitement that we were gripped by when we ventured to the desi cinemas in London to watch Nagin when it opened way back in the mid 70s. Reena Roy really turned it on and the film success encouraged a plethora of welcome copycats. In the late 80s Sridevi and Amrish Puri powered Nagina to unimagined box office heights. I remember the cook of a cousin in Bombay who would prepare some wonderfully spicy dishes while listening perpetually to an audio cassette of the dialogs from Nagina. He had them memorized down to the last hiss. Nagina even spawned a sequel which in the 80s was unheard of for Bollywood and ever were audiences better versed in the fangled legends of the Manidhari and Ichchadhari Naags and Nagins then by the time Nigahen: Nagina II hit screens. Another epic of the era was Sheshnaag with Jeetendra and Madhavi providing one of the most exhilarating snake dances in history and Danny cutting an imposing evil Tantrik. On a recent trip to the wonderful environs of the sadly decaying Naaz Compound in Bombay I discovered some wonderful DVD/VCD shops though one or two of them were evidently less than kosher as one for example did not allow any browsing at all. You had to know what you wanted before hand or the door was rather rudely shut in your face. After two such encounters I finally happened upon a shop that welcomed customers and here I discovered a treasure chest of horror movies and more crucially some incredible looking snake movies too. those I managed to pick up wereNaag Shakti, Naag Pratiksha, Naageshwar, Shiva Naaga, Naag Nagin, Naach Nachaye Nagin, Naagyoni, a title that I cannot decipher but it looks spectacular judging by the posse of snakes on the DVD cover and my own personal favourite of all snake movies. This being 1990’s stupendous Aruna Irani, Jackie Shroff snake epic Doodh Ka Karz. Never has there been such gut wrenching pathos and searing drama in a snake movie as witnessed in this tour de force. The director introduces the fabulous innovation snake-cam where the camera takes on the Point of View of the snake, watching his master getting murdered from within his straw basket. There are moments of “heartfelt emotions” (Don’t you miss those old trailers?) when Aruna Irani almost breast feeds a cobra and a stupendous hair-raising climax that features leaping cobras by the dozen, live mongooses and Bob Christo meeting a slithery end. I have since watched the quite splendid Shiva Naaga which featured among other things a couple vomiting live chickens and a sterling James Bond-like chase scene with a bad guy being chased downstream by a cobra in a boat! So, what you’re favourite Snake Movie?